Located in central Berlin, the Mercedes-Benz Arena is easy to reach by public transport, which is what we recommend. But if you have to drive, simply follow the signs towards "Friedrichshain" and "Mercedes Platz" in the city. Remember it's good to allow extra time when arriving by car. Get here as early as possible to avoid traffic. Cycling to the Mercedes-Benz Arena is a great idea. We have numerous cycle racks right next to the Arena on Hedwig-Wachenheim-Straße. We recommend using the cycle route from Mühlenstraße. Getting here via Warschauer Brücke is also possible, but please be aware that access is via stairs. Park & Ride describes the combination of travelling by car and public transport. Berlin's Park & Ride options are great for all guests who have to drive but would like to avoid event-related traffic. 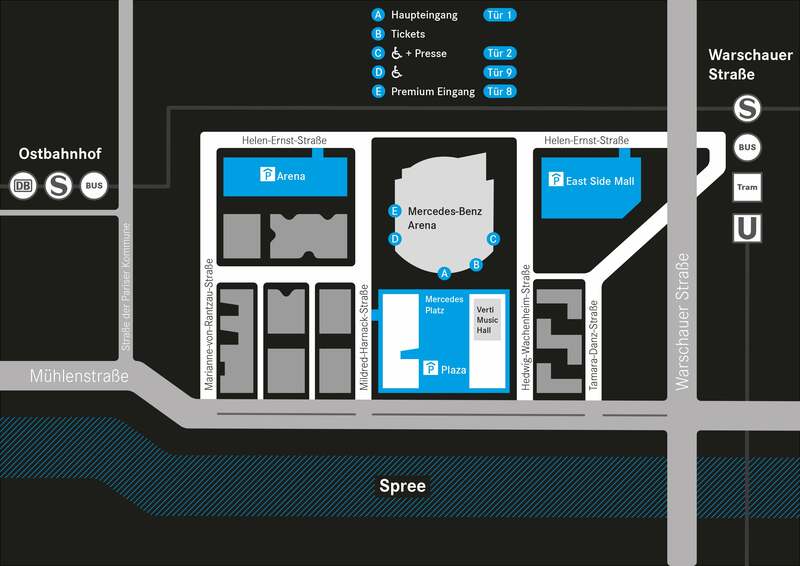 The suggested Park & Ride facilities are parking areas in close proximity to public transport connections and allow a quick and convenient transfer to regional, S- and U-Bahn trains going to the Mercedes-Benz Arena. The pier of Mercedes-Benz Arena is currently only used by ocean carrier Riedel.